A family-centered approach to teaching individuals skills necessary to succeed in the home, school and community. Focused ABA Services: We provide short-term ABA services in the home, clinic, community with an emphasis on parent training. We address the goals that are the greatest priorities of the family. Parent participation is required to help families be successful when trainers are not present. Frequency and duration of services are individualized based on each child’s focused goals. Clinical Staff: All services are overseen by a Board Certified Behavior Analyst (BCBA). BCBAs are individuals who have met national standards to direct, manage, and supervise ABA programs. 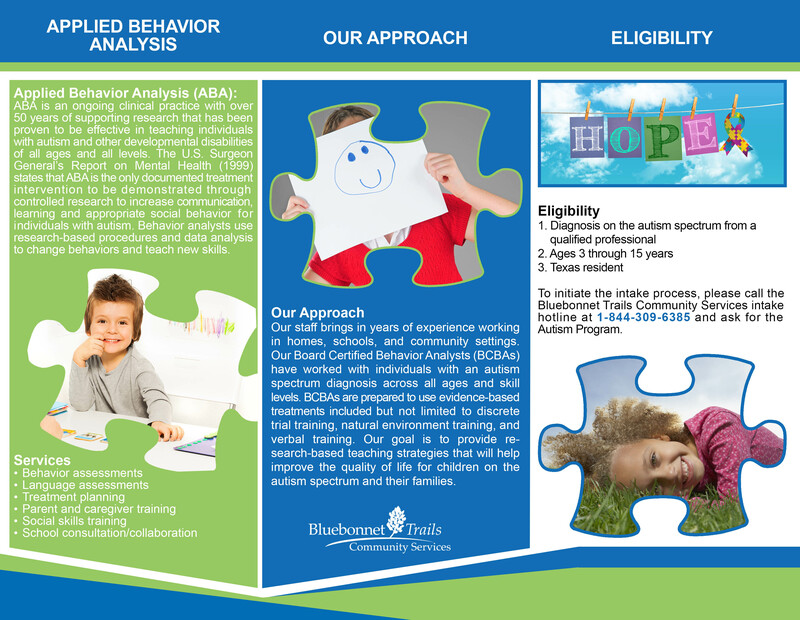 Board Certified Assistant Behavior Analysts (BCaBA) and behavior technicians may also provide ABA services and will be supervised by a BCBA. Collaboration with other professionals: We can collaborate among and between school personnel and any additional service professionals to provide a consistent approach to achieving the common goals. We will follow ISD policies and procedures for collaboration. Training Opportunities: We provide training opportunities throughout the year for family and community members to learn about ABA. We also conduct social skills groups for various age groups. Funding: Our program is funded by private insurance reimbursement, family cost share, and a grant from the Department of Assistive and Rehabilitative Services (DARS). Family size and income will be used to determine each families cost share for services. Partners: Bluebonnet Trails is proud to partner with the University of Texas and Easter Seals Central Texas. 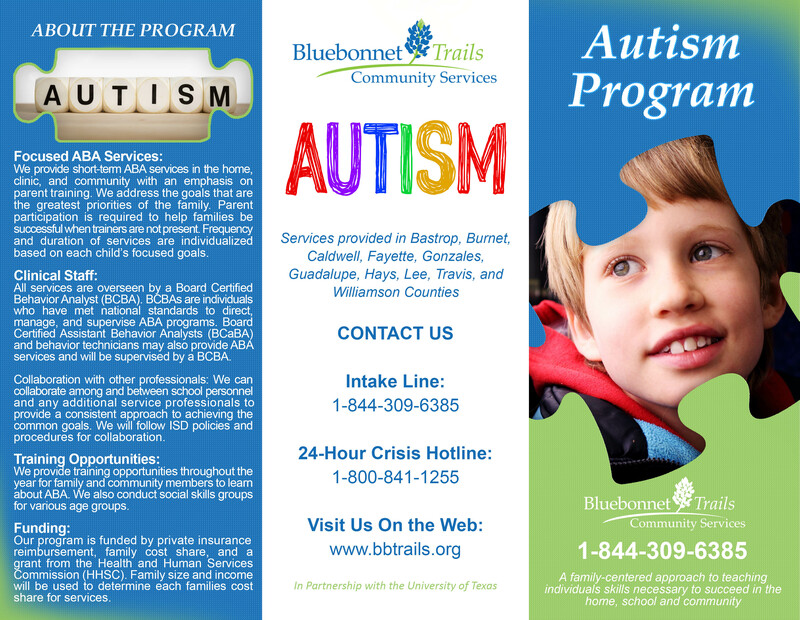 To initiate the intake process please call The Bluebonnet Trails intake hotline at 1-844-309-6385 and ask for the Autism Program.